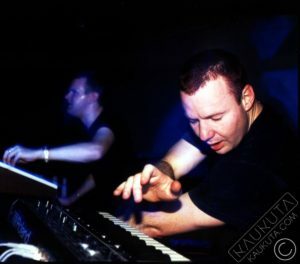 UNION JACK was born as the collaboration between SIMON BERRY (founder of PLATIPUS RECORDS) and KAUKUTA in 1993. Simon was impressed with Kaukuta’s Urban Shakedown music and Kaukuta was impressed with Simon’s Art Of Trance Poltergeist acid sound, so after a quick and successful remix collaboration it was time for the duo to write some original material … and Union Jack came into being. Union Jack produced a list of classics to much success (“Two Full Moons and a Trout”, “Red Herring”, “Cactus”) and along with POB front man Paul Brogden they toured as both Union Jack and as the Platipus sound system (Union Jack, Terra Ferma, Art Of Trance and POB) for many years around the world. There were many appearances at Miami’s Ultra Music festival, N America, Europe, Russia, Asia and Australasia ending with a show at the 2008 Ultra for their tenth anniversary. Union Jack wrote one album with Kaukuta (There will be no armageddon) and later a second album (Pylon Pigs) with Paul Brogden picking up where Kaukuta left off a few years earlier to pursue other avenues. Union Jack regularly plays live today.